* Unicode viewer scroller bug fixed. Now you can view more unicode text. # Through Transliteration feature you can type your language in English as you normally speak and it will be converted into selected language Unicode automatically. Your feedback is very important to make this application better. 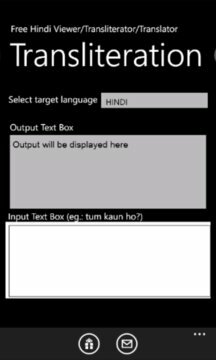 This App lets you view Hindi, Marathi or any unicode text that your windows phone does not support. You can also compose hindi message and share it. It's a very useful application as windows phone currently does not supposrt some unicode fonts ie. hindi, marathi etc. You just need to copy and Paste Hindi, Marathi or any other unicode text from other apps, web sites to this apps text box and now you can see the text behind boxes. * Send composed hindi sms. * You can view unicode text that is not supported by your phone. * You can share text by SMS or Email.